Cadillac gives the extended-length Escalade ESV full-size luxury SUV lineup several updates and new features for the 2016 model year. The Escalade ESV ESV is 20 inches (508 mm) longer than its regular-length Escalade ESV thanks to a wheelbase that is 14 inches (355 mm) longer. 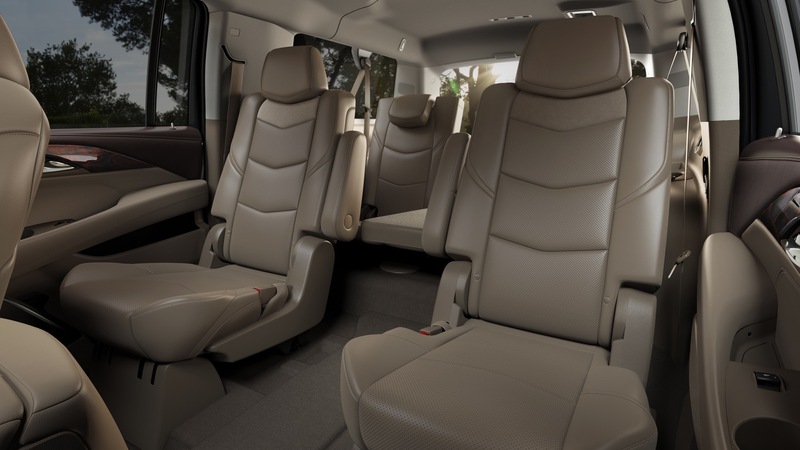 The increased length maximizes space for third-row passengers and nearly doubles the cargo space behind the third-row seat. The exterior design of the 2016 Escalade ESV continues on with just a few changes from the 2015 Escalade ESV, which marked the launch of the all-new fourth-generation model. The change to the exterior includes four new colors and the new Cadillac Crest logo without the wreath. The design provides a signature look of quality, elegance and capability. The styling cues combine sculpted surfaces and high technology embellishments to give Escalade ESV a unique and stand-out appearance. The headlamps incorporate the industry’s first Total Internal Reflection LED high-beam function, which consists of four vertically stacked crystal lenses and LEDs. The low beam consists of five crystal lenses and LEDs that create the light pattern. The Cadillac script is branded in the headlamp bezel. Tall, thin vertical LED taillamps reach to the top of the Escalade ESV and feature the brand’s wreath-and-crest insignia, which illuminates in the dark. New inlaid doors fit into the body side openings instead of over the top of the body, significantly improving the quietness of the interior and contributing to improved aerodynamics – an attribute that helps Escalade ESV slip through the air on the highway with less drag for greater efficiency. Lightweight aluminum hood and aluminum liftgate panels also enhance efficiency through reduced overall mass. The 2016 Escalade ESV is the extended-length variant of the regular-length 2016 Escalade. It is exclusively available as a four-door SUV. Inside, the 2016 Escalade ESV sees the new Crest logo adorn the steering wheel. Cut-and-sewn materials and wood trim, chosen for elegance and authenticity, combine with the latest technologies to convey an exceptional level of luxury. Craftsmanship defines the 2016 Escalade ESV’s passenger space, which is designed to be one of the industry’s most authentic and luxurious cabins – with seamless technology integration for today’s connected luxury customers. And like the exterior, there’s harmony with Cadillac’s other vehicles in the cabin’s appearance, amenities and controls. 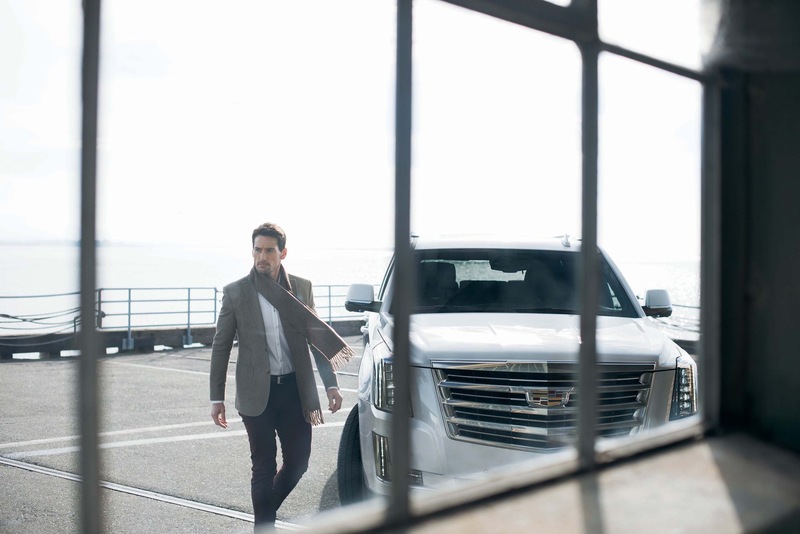 Escalade ESV is also a quieter environment compared to the last generation thanks to a stronger body structure, enhanced use of noise-attenuating materials and processes, including triple-sealed doors and acoustic-laminate glass and Bose Active Noise Cancelation technology. Even the exterior mirrors were carefully shaped in the wind tunnel to reduce wind noise. The CUE (Cadillac User Experience) infotainment system is standard on the 2016 Escalade ESV. It is an advanced system for connectivity and control, with state-of-the-art voice recognition and touch controls. Cadillac’s CUE system with an eight-inch-diagonal multi-touch screen is compatible with Apple CarPlay, a phone integration technology that puts iPhone features (iPhone 5 and later) on the display in a smart, simple manner. Many features can be controlled via voice commands through a steering wheel button, helping drivers spend more time with their eyes on the road and hands on the wheel. Apple CarPlay takes the iPhone features most owners want to access while driving and puts them on the vehicle’s display to allow drivers to make calls, send and receive messages and listen to music right from the touchscreen or by voice via Siri. Apple CarPlay-supported apps include Phone, Messages, Maps, Music and compatible third-party apps. Complementing CUE to enhance Escalade ESV’s connectivity is OnStar with 4G LTE and standard built-in Wi-Fi hotspot. It provides a mobile hub for drivers and passengers to stay connected. The hotspot is on whenever the vehicle is on and comes with a three-month/three gigabyte data trial. To note, OnStar 4G LTE with Wi-Fi Hotspot is standard on the 2016.5 model year Escalade ESV. The 2016 models featured the 2G-based OnStar connection without the Wi-Fi hotspot. The 2016 Escalade ESV features a new Bose Centerpoint surround sound system that is the most advanced ever in a Cadillac. Customized exclusively for the Escalade ESV, it features new technologies that help heighten the sophisticated in-vehicle experience. A Blu-Ray DVD rear entertainment system is available. It is tied into the audio system and includes a nine-inch, roof-mounted screen on the regular-wheelbase Escalade ESV, and two nine-inch screens on Escalade ESV ESV. The overhead system also includes built-in remote storage, USB, SD car and RCA ports. The all-new 2016 Escalade ESV advances performance with an all-new, more powerful and more efficient 6.2L V8 L86 engine rated at an SAE-certified 420 horsepower (313 kW) and 460 pound-feet of torque (623 Nm), up nearly 5 percent in horsepower and 10 percent in torque over the engine it replaces. The greater torque delivers an enhanced feeling of power on demand and greater confidence when trailering. Advanced combustion system designed to make the most of power, torque and efficiency across the rpm band. The more precisely controlled combustion enables Escalade ESV to run with a higher compression ratio, which delivers greater power and greater efficiency. Starting from the 2015.5 model year, the 6.2L V8 L86 engine is matched with the Hydra-Matic 8L90 M4U eight-speed automatic transmission with TapShift control. The GM-developed 8L90 is roughly the same size and weight as the 6L80 six-speed automatic, with a 7.0 overall gear ratio spread that provides a numerically higher first gear ratio, helping drivers start off more confidently with a heavy load or when trailering. The 8L90 also enables a numerically low 3.23 axle ratio, which reduces engine rpm on the highway – an attribute that contributes to fuel economy and quietness. What’s more, the new 6.2L V8 L86 engine is powerful enough to enable 0 to 60 mph performance of less than 6 seconds in the new Escalade ESV: 5.96 seconds for Escalade ESV 4WD and 5.98 seconds for Escalade ESV ESV 2WD. Escalade ESV’s performance is channeled to the most sophisticated chassis and suspension system ever in the vehicle. It was engineered for a greater feeling of solidity and a quieter, smoother ride. A fully boxed frame – composed of more than 75 percent high-strength steel – is the foundation for its ride quality. Escalade ESV’s new technologies include safety features to help protect occupants before, during and after a collision. For instance, front and rear automatic braking relies on short-range radar technology and ultrasonic sensors to help the driver avoid front and rear low-speed collisions via a progression of alerts that extend to complete braking, if necessary. Escalade ESV also offers the segment’s only Front Center Air Bag, which deploys from the inboard side of the driver’s seat and inflates between the driver and front passenger, thereby providing added protection for both front occupants in side-impact crashes. Additionally, Front and Rear Park Assist are standard on all models, while the Side Blind Zone Alert, Rear Cross Traffic Alert and Lane Change Alert are standard on Luxury, Premium, and Platinum models. Introduced on the 2015.5 Escalade ESV, the Surround Vision system is standard on all models and uses cameras to provide a 360-degree bird’s eye view of the Escalade ESV via the CUE color display screen. An update for 2016 allows the driver to select a front-camera-only view. The 2016 Cadillac Escalade ESV continues to be manufactured at GM’s full-size SUV production plant in Arlington, Texas. The Cadillac Escalade ESV remains squarely in the extended-length full-size luxury SUV segment that solely includes the Lincoln Navigator L.
The Escalade ESV has won J.D. Power’s Initial Quality Survey for its segment the last four years and captured J.D. Power’s Dependability Award for 2014. All models are offered with 2WD and 4WD drivetrains, as well as a new 6.2L V8 L86 engine that is more powerful and more efficient than the engine in previous Escalade ESV models.